It sounds counterintuitive, but there are times when retaining a short-term history in incognito mode is helpful. The whole point of using Chrome’s incognito mode is that it leaves no trace of your browsing activity. Whether you’re using incognito for prurient reasons or as a security precaution, sometimes it makes sense to retain a browsing history in the short term. One way to do that is to keep all the tabs you’ve used open so you can keep hammering on the back button. 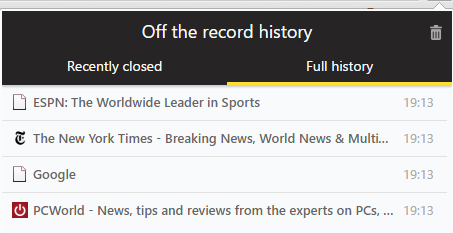 Another option is to use the Chrome extension Off The Record History. When enabled, this extension maintains a browsing history for your incognito sessions. The key is the extension retains that history only while the incognito browser window is open. Once you close it your history is erased. You can also manually erase your incognito history through the extension before shutting down the browser. To use the extension download and install it from the Chrome Web Store. Then open a regular browser tab, type chrome://extensions, and hit Enter. You have to manually enable Off The Record History to work in incognito mode. This will take you to the extensions settings page. Now, scroll down the page until you get to the Off The Record History entry, and click the checkbox for Allow in incognito. Clicking the box will trigger a warning that the extension might record your browser history, which doesn’t apply to us since that’s the whole point of this extension. Off The Record History at work in incognito mode. Now open an incognito window and start browsing. You can freely close tabs and if you ever need to find a page you were on previously click the extension’s icon. By default, it shows you the tabs you recently closed in a drop-down window. If you need to go back further click on the Full history option to see all your browsing in that incognito session. If you want to delete the extension’s history manually click the extension’s icon, and then click the trash icon in the upper-right corner of the drop-down window. For those who only want to use Off The Record History infrequently. Disable it by unchecking the incognito checkbox under chrome://extensions, and then rechecking it when you want to use it. You may not want to keep a short-term log of your incognito browsing history all the time, but there are those moments when it comes in handy.